From Goodreads ~ Grace Willingdon has everything she needs. For fifteen years she’s lived in a trailer overlooking Bras d’Or Lakes in postcard-perfect Baddeck, Cape Breton, with Fletcher Parsons, a giant teddy bear who’s not even her husband. But Grace’s blissful life is rudely interrupted when her estranged son calls from New York City, worried about his teenaged daughter. Before she knows it, Grace finds herself the temporary guardian of her self-absorbed, city-slicker granddaughter, Melissa. Trapped between a past she’s been struggling to resolve and a present that keeps her on her toes, Grace decides to finally tell her story. Either the truth will absolve her or cost her everything. Grace is sixty, retired and living in a trailer in Baddeck, Cape Breton, with her best friend, Fletcher, and their cats and dogs. When her estranged son, Jonathan, contacts her and asks for help with his rebellious teenage daughter, Melissa, she doesn't hesitate and jumps on a plane and heads to New York City. To get Melissa away from the bad influences in her life, Grace takes her back to Cape Breton to her roots. 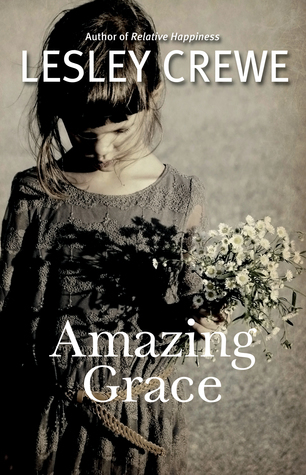 They spend time at the farmhouse where Grace spent her teenage years and Grace tells Melissa the stories from her past, stories of abandonment and abuse. As Grace tells Melissa theses stories she'd never told anyone else, she feels a sense of relief and empowerment. With a new sense of purpose, Grace moves forward, mending the past in order to fix her future. This was an interesting and deep story at times and I enjoyed it. It's written in first person perspective in Grace's voice. The book jumps back and forth from the present ("Now") to the past ("Then") as Grace tells of her life in the past and what's happening now. I lived in Cape Breton for a few years and I thought the author did a very good job in capturing the personalities of those who lived there. As a head's up, there is swearing. I liked Grace. She's feisty and swears a lot but deep down, she does care about those around her. Fletcher was a good match for her. Though they have lived together for fifteen years and are best friends, there's never been anything between them. They share their love of animals and a quiet life and it's obvious they care about each other.